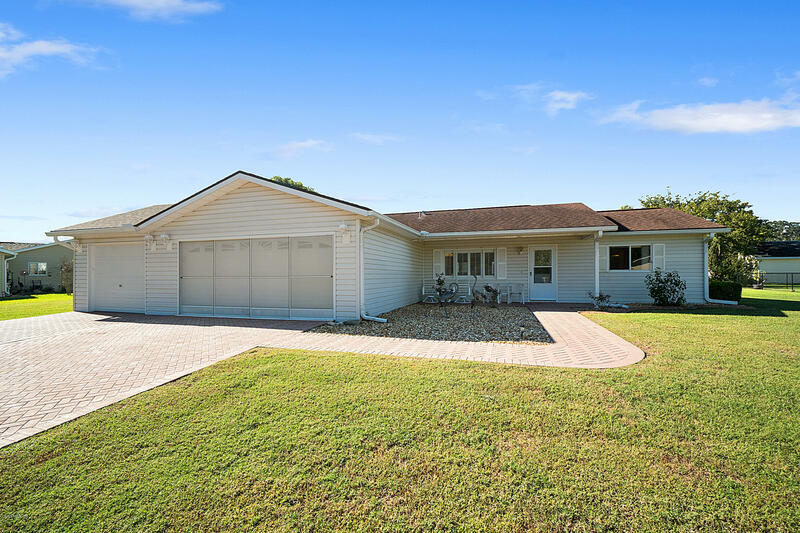 17558 SE 102nd Avenue, Summerfield, FL.| MLS# 546464 | Spruce Creek Realty...Retirement Communities in Florida, Resale Homes In Spruce Creek South, The Villages, Stonecrest, Del Webb. Fabulous,one of a kind, Custom home with rare 3 car garage. Home is in impeccable condition, 1558 sf of living area, including a 160 sf sun room with tile floor and glass windows,which was added on in 2112. Total area under roof is 2238 sf. Great curb appeal, pavers in driveway, nicely landscaped, concrete curbing around shrubs Two large bedrooms with large open floor plan between them. Kitchen open to living & dining rooms with a 15 x 10 Florida room off the dining room. Florida room, under house roof heat & air, leads to the sun room which is at the same level as the Florida room & the rest of the house. Kitchen & baths have tile floors, inside laundry room has newer Samsung washer & dryer. Plantation shutters in living, dining, Florida & sun room.